Network providers have relied on optical networks as scalable, low cost, general-purpose aggregation and transport infrastructures. The emerging communciations services environment is placing significant stresses on metro networks. As the existing evolves to relieve these stresses, the networks must address three critical challenges: providing significantly more bandwidth at lower cost, delivering scalable Ethernet infrastructure, and managing simultaneous growth of time-division multiplexing and Ethernet Traffic. eWAVE is helping its customer to evolves their aggregation and transport infrastructure.The Metro Packet Optical Networking Solution from eWAVE Systems provides a flexible infrastructure for reliable service delivery, massive scalability and greater reach. 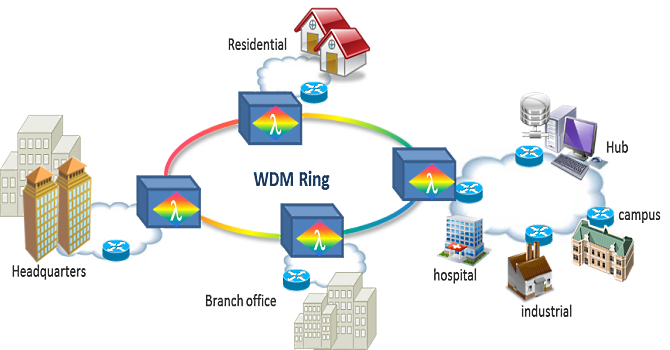 By converging packet and optical layers within a single platform, it's ables to integrate Carrier Ethernet technologies with a “touch-less” WDM optical layer and service-centric management. Thus, it simplifies network operations and enhance service delivery. eWAVE4107DiR product platforms is available in metropolitan and regional application. These carrier-grade optical networks products are based on G.709, supporting transparent transport of multi-service from 100Mbit/s to 10Gbit/s, next to 40G bit/s.